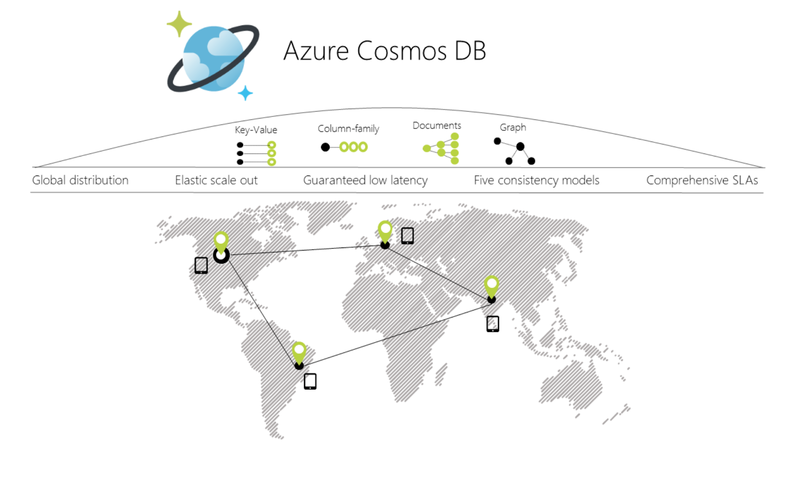 Microsoft Azure Cosmos DB team. But I underestimated how much there is to learn about, and how long it would be to develop a good sense of the big picture. By “developing a good sense of the big picture”, I mean learning/internalizing the territory myself, and, when looking at the terrain, being able to appreciate the excruciatingly tiny and laborious details in each square-inch as well. This is a lot like learning to drive. You start in the parking lots, in less crowded suburbs, and then as you get more skilled you go into the highway networks and get a fuller view of the territory. It is nice to explore, but you wouldn’t be able to do it until you develop your skills. Even when someone shows you the map view and tell you that these exists, you don’t fully realize and appreciate them. They are just concepts to you, and you have a very superficial familiarity with them until you start to explore them yourself. When I started in August, I had the suspicion that I needed to unpack this term: “cloud-native”. In addition to the local replication inside a replica-set, there is also geo-replication which implements distribution across any number of Azure regions —50+ of them. 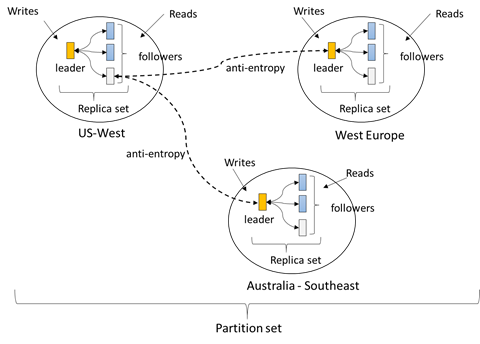 Geo-replication is achieved by a nested consensus distribution protocol across the replica-sets in different regions. Cosmos DB provides multimaster active-active replication in order to allow reads and writes from any region. For most consistency models, when a write originates in some region, it becomes immediately available in that region while being sent to an arbiter (ARB) for ordering and conflict resolution. The ARB is a virtual process that can co-locate in any of the regions. It uses the distribution protocol to copy the data to primaries in each region, which then replicate the data in their respective regions. The Cosmos DB distribution and replication protocols are verified at the design level with TLA+ model checker and the implementations are further tested for consistency problems using (an MS Windows port of) Jepsen tests. Cosmos DB is engineered from the ground up with resource governance mechanisms in order to provide an isolated provisioned throughput experience (backed up by SLAs), while achieving high density packing (where 100s of tenants share the same machine and 1000s share the same cluster). To this end, Cosmos DB define an abstract rate-based currency for throughput, called Request Unit or RU (plural, RUs) that provide a normalized model for accounting the resources consumed by a request, and charge the customers for throughput across various database operations consistently and in a hardware agnostic manner. Each RU combines a small share of CPU, memory and storage IOPS. Tenants in Cosmos DB control the desired performance they need from their containers by specifying the maximum throughput RUs for a given container. 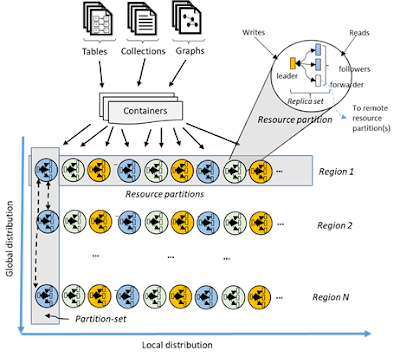 Viewed from the lens of resource governance, Cosmos DB is a massively distributed queuing system with cascaded stages of components, each carefully calibrated to deliver predictable throughput while operating within the allotted budget of system resources, guided by the principles of Little’s Law and Universal Scalability Law. The implementation of resource governance leverages on the backend partition-level capacity management and across-machine load balancing. By leveraging on the cloud-native datastore foundations above, Cosmos DB provides an almost “one size fits” database. Cosmos DB provides local access to data with low latency and high throughput, offers tunable consistency guarantees within and across datacenters, and provides a wide variety of data models and APIs leveraging powerful indexing and querying support. Since Cosmos DB supports a spectrum of consistency guarantees and works with a diverse set of backends, it resolves the integration problems companies face when multiple teams use different databases to meet different use-cases. Vast majority of other data-stores provide either eventual, strong consistency, or both. In contrast, the spectrum of consistency guarantees Cosmos DB provides meets the consistency and availability needs of all enterprise applications, web applications, and mobile apps. Cosmos DB enables applications decide what is best for them and to make different consistency-availability tradeoffs. An eventually-consistent store allows diverging state for a period of time in exchange for more availability and lower latency and maybe suitable for relaxed consistency applications, such as recommendation systems or search engines. On the other hand, a shopping cart application may require a “read your own writes” property for correct operation. This is served by the session consistency guarantee at Cosmos DB. Extending this across many clients requires provides “read latest writes” semantics and requires strong consistency. This ensures coordination among many clients of the same application and makes the job of the application developer easy. The strong consistency is preserved both within a single region as well as across all associated regions. The bounded staleness consistency model guarantees any read request returns a value within the most recent k versions or t time. It offers global total order except within the staleness window, therefore it is a slightly weaker guarantee than the strong consistency. Another way Cosmos DB manages to become an all-in-one database is by providing multiple APIs and serving different data models. Web and mobile applications need a spectrum of choices/alternatives for their data models: some applications need SQL, while others take advantage of simpler models, such as key-value or column-family, and yet some other applications require more specialized data models, such as document, key-value, column-family, and graph stores. Cosmos DB is designed to support APIs and data models by projecting the internal document store into different representations depending on the selected model. Clients can pick between document, SQL, Azure Table, Cassandra, and Gremlin graph APIs to interact with their datastore. This not only provides great flexibility for our clients, but also allows them to effortlessly migrate their applications over to Cosmos DB. Next: What Is a Manifold?